All The Tea In China, India and Africa. Click the image to download. A more up-to-date version of this poster can be found here. I love tea. And while studying, drinking and writing about tea, I’ve categorized all the teas you’re ever likely to encounter onto one simple poster. There are thousands more rarer types and subtypes, which you can add yourselves via the comments section. This selection is a great start (and it’s all I’m willing to show you). If you learn only one thing from this diagram, it should be that there are thousands of types of tea. Tetley Pyramid Teabags are just the beginning (overpriced sweepings from the factory floor). Sources: The Story of Tea, 识茶泡茶品茶 (Chinese book), tea blogs too numerous to list, and personal experience (teas I drank) and Baidu. Darjeeling is coloured ‘teal’ because it is technically a Oolong tea, despite being classified widely as a Black tea. Black tea is coloured ‘red’ because the Chinese classify tea by the liquor colour rather than the colour of the dried leaves. Pu’er is sometimes considered a separate category because of its popularity. In which case, the other (non-Pu’er) Dark teas are usually ignored. I’ve chosen to include both Pu’er and non-Pu’er Dark teas in this poster. There are many more sub-types of each tea. Take Iron Buddha, for example, which has its own characteristics within the class of “Iron Buddha”. Age, oxidation level and unique fragrance are but some of these many characteristics. Sundried Green teas such as those made for local consumption in Xishuangbanna, Yunnan, are coloured ‘white’ because they are technically white teas, despite the production process having been re-evolved as a shortcut to Green tea production. Sundried Green teas are distinguished further from the other Green teas because, like the vast majority of White teas, they usually use large-leaf Assamica subspecies of tree (Chinese: 古茶树; English: “India Bush”). Modern Flower teas are usually classified as Green, White or Black, depending on the leaf colour. These modern Flower teas are (almost) an existing tea blended with flower or flower essence. However, the traditional method of Flower tea manufacture (via a Zaobei leaf), was totally different from that of any of the other six tea categories. I have therefore included Flower teas as a seventh type of tea (to which some tea-lovers may protest). Be quiet. Drink tea. I’m sure it’s a very good tea. Generally speaking, Chinese tea plantations are larger than Indian and African ones. So there are many more distinct-tasting single-estate teas from India and Africa than from China. If all of the Indian and African estates were included, the resulting diagram would be asymmetrical and crowded with teas that most people will never have the opportunity to taste. For these reasons, I included only a selection of (mostly famous) Black teas on this diagram. Please forgive me for doing so. The main lesson I want people to learn from this chart is, “there are so many different types of tea”. I hope it does that. If you want to send me a sample of NTingwe tea, I’d be very happy to review it. And thank you for visiting! — James. I would love to send you a sample but I am only a devoted consumer. I will be sure to add this tea (and a few other popular missing teas) to my second version of the Tea Taxonomy diagram. Are there any teas you can suggest? Absolutely amazing job! I love tea and using this format of presenting most of the Tea types is enlightening! It would make such a good wall poster if blown up! Keep it up. I learned a lot making this diagram. I would love to make a larger poster of this. The new version includes more common names for some of the teas, and some (debatable) corrections. I’ve also added more Indian and World teas to the list. I’m glad you like it, too! Would you be willing to send a pdf of this to me? I would love to give it to my daughter-in-law who comes from Beijing! I found someone with the iMindMap 6 software, and they were kind enough created a PDF version of the chart for me. I hope the quality is high enough for printing. Great effort. Interesting and helpful to (start) to really clarify some of the tea types. Would it be possible to also get the PDF copy you mention above?! If you ever make this into a wall poster, I would totally buy it! 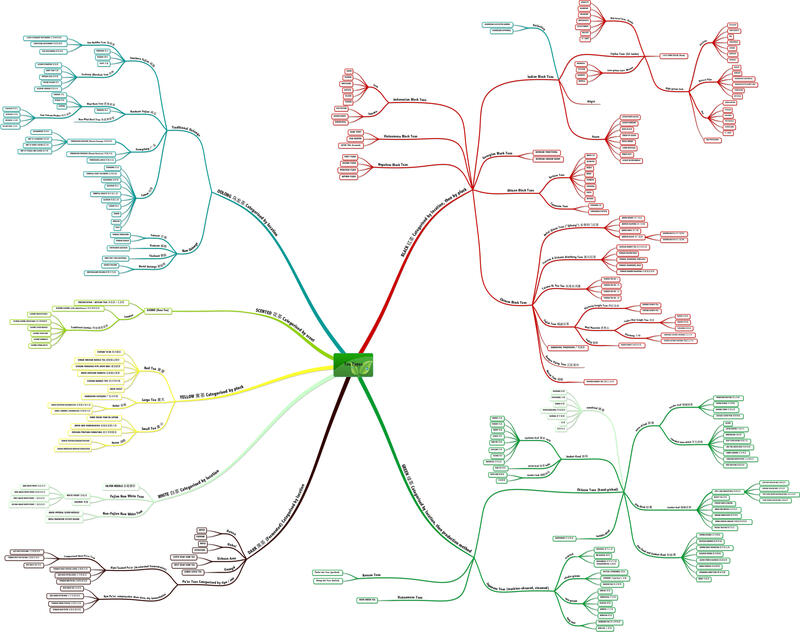 Kindly tell the people on the Reddit group that there’s an updated version here https://jameskennedymonash.wordpress.com/2012/12/25/tea-types-2012-pdf-version/ and it was created in iMindMap 5.0 for Mac, the best software for making mind maps! (I’ve tried lots of them). If you like it, download the PDF from the above link and print it yourself as a poster in your local office-supplies store (Stales, OfficeWorks, etc). I’m pleased that you like it! This is wonderful. It’s nice seeing all of this in graphic form. Thanks for taking the time to create and share this. Hiya! I know it is style of away from matter however My partner and i was wondering which in turn blog platform are you currently utilizing because of this web page? I’m getting tired connected with WordPress mainly because I’ve received issues with cyber criminals and I’m considering methods of one more platform. I might always be fantastic if you could position me personally on the way to an excellent system.